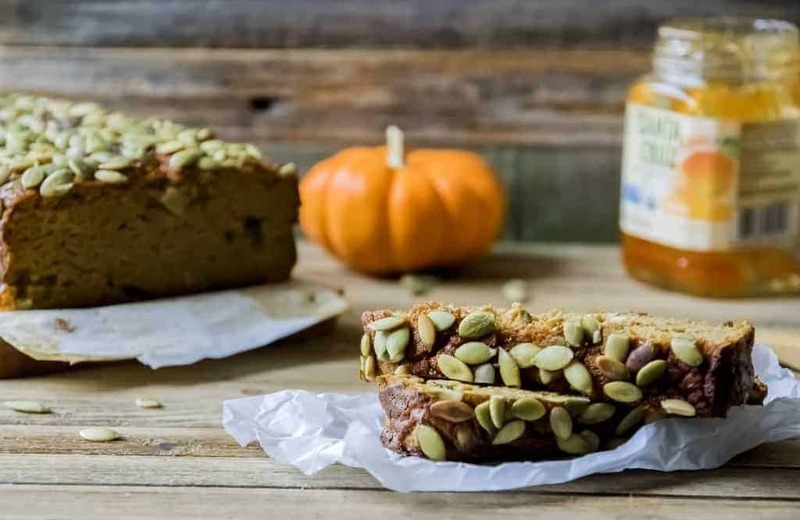 Coconut Flour Pumpkin Bread with Pepitas is delicious, guilt-free breakfast option that is packed with fall flavors. Fall is by far my favorite season. There is a cozy nip in the air, gorgeous yellow-orange colors all around and the warm smell of pumpkin pie baking in the oven. Not to mention, that the kid is back to school and I can drink my morning coffee in peace. The moment I see a hint of color on the trees in my backyard, I get this huge desire to sprinkle Pumpkin pie spice on practically everything. Nothing warms up my heart than biting into a slice of warm pumpkin bread and sipping on pumpkin spice latte! As a Type 1 diabetic, with a sweet tooth, I’m always on a lookout to satiate my sugar craving, without shooting up my blood sugar over the roof. Though I’m not gluten intolerant, wheat flour, even the whole wheat variety, wreaks havoc on my blood sugar. I cannot even begin to describe how horrible I feel, after a sugar crash. Over the years, I have experimented with a lot of gluten-free blends. Of late, Coconut Flour had emerged as my favorite gluten free flour. Learn more about the amazing ingredients in this gluten-free recipe, then read on for how to make it. Don’t forget to print out the recipe card for later! So what is Coconut Flour? What’s a bread without a little crunch! Do you have a favorite recipe using coconut flour? Share in the comments! After all the coconut milk has been extracted from the coconut meat, it is then dried and powdered to make Coconut Flour. It is completely grain free. Coconut Flour is packed with high levels of healthy saturated fats in the form of medium-chain fatty acids (MCFA). It is a low glycemic food and does not spike blood sugar levels. Packed with its high amount of soluble and insoluble dietary fiber and healthy MUFA (Mono Unsaturated Fatty Acids), it not only helps in healthy digestion but aids in heart health too. Baking with Coconut Flour can be a bit challenging. It is extraordinarily absorbent and requires more wet ingredients, to keep the baked goodies, soft and moist. A little goes a long way when it comes to Coconut Flour. Because of the complete lack of gluten, this recipe for Coconut Flour Pumpkin Bread with Pepita relies on eggs (lots of them!) to give it structure. The eggs are whipped to incorporate as much air as possible to make a lighter bread. 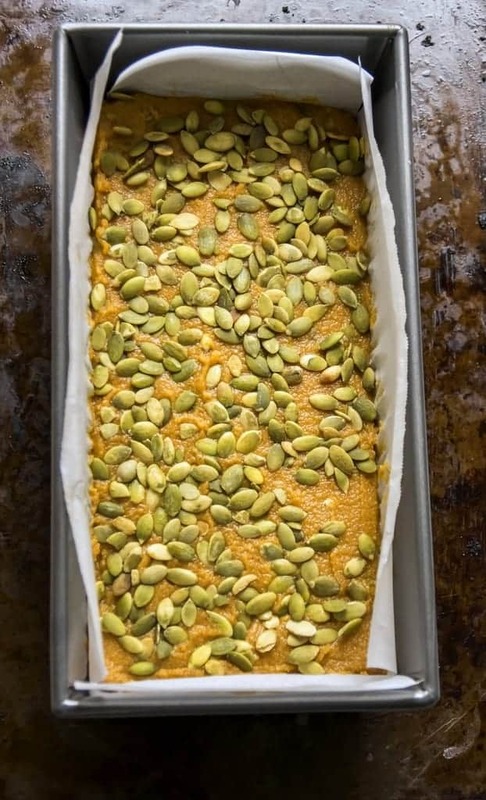 Pumpkin puree, maple syrup, vanilla extract and coconut oil is then incorporated to make the bread incredibly moist and flavorful. The dry ingredients are gently folded in without deflating the air that was whipped, to result is a fluffy bread. I love to add seed or nuts to my bread. Not only does it add another layer of flavor and crunch but brings a host of nutrients too. 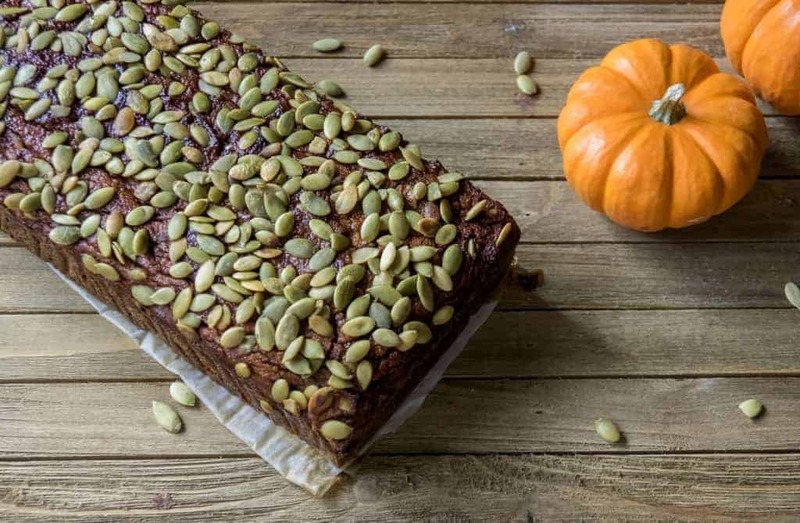 Like for this Coconut Flour Pumpkin Bread recipe I have used Pepita or Pumpkin seeds. But you can substitute walnuts or pecans if you prefer. Or leave them out altogether. Pepita or Pumpkin seeds are nutritional powerhouses. They are packed with a wide variety of nutrients from magnesium and manganese to copper, protein, and zinc. They also contain plant compounds known as phytosterols and free-radical scavenging antioxidants, which can give your health an added boost. If Fall means pumpkin patches, hay rides, apple picking for you, it means Coconut Flour Pumpkin Bread in our house. We simply cannot get enough of this incredibly moist, delicious yet “good for you” bread. It is breakfast staple in our house. 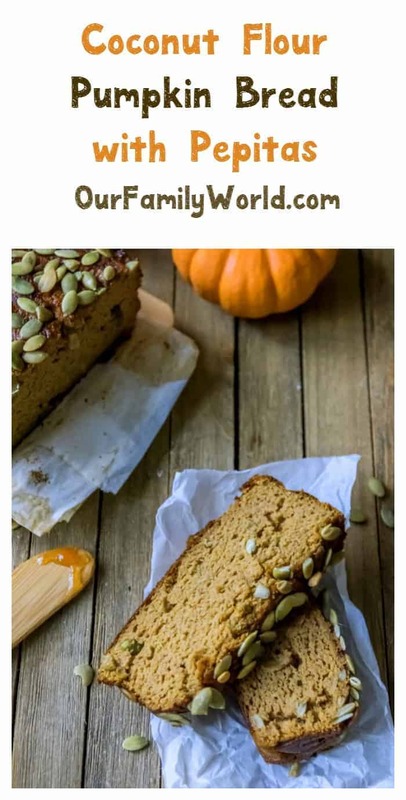 Once you serve this Coconut Flour Pumpkin Bread with a scoop of Vanilla bean ice-cream and caramel sauce, I bet it will become your favorite Thanksgiving dessert! Line an 9″×4″ loaf pan with parchment paper. Leave it hanging a little on the sides. It’ll be easier to get it off the pan. In a mixing bowl, sift together the coconut flour, pumpkin spice, baking soda and baking powder. Set aside. 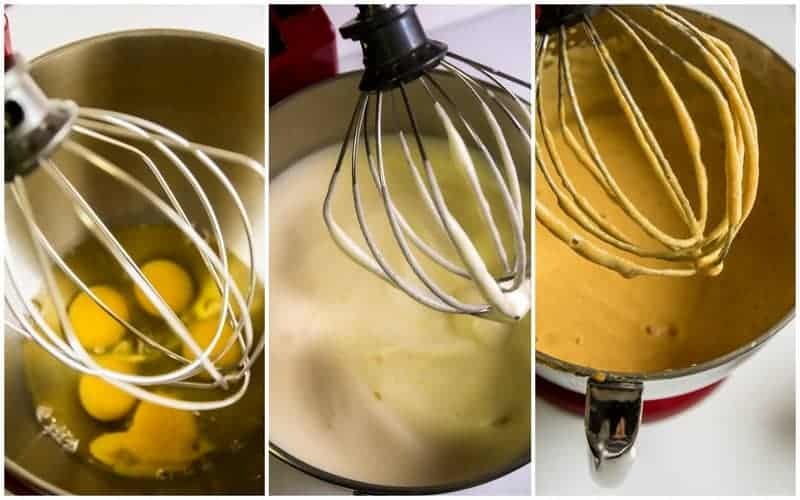 With a stand mixer fitted with a whipping attachment, or hand-held electric mixer, whip the eggs (on high) until pale yellow (almost white) and triple in volume. It might take anything between 5 to 10 minutes, depending on the power of your mixer. While the eggs are whipping, in a mixing bowl, sift together the coconut flour, pumpkin spice, baking soda and baking powder. Keep aside. 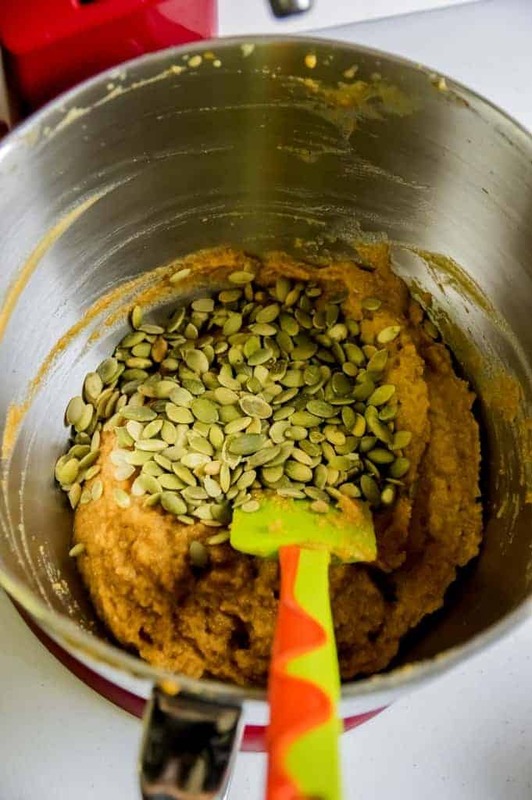 In a separate bowl, combine the pumpkin puree, vanilla extract, maple syrup, and coconut oil. Whisk it well with a wire whisk into a smooth mixture. Once the eggs are well whipped, reduce the speed to low and add pumpkin puree mixture, a couple of tablespoon at a time, till everything is homogeneously mixed. Now, remove the whipping attachment and attach the paddle attachment. At a very low speed add the coconut flour-spice mixture in small batches, and gently mix until just incorporated. Do not overmix. Add ¼ cup of raw pepitas and gently fold in with a spatula. Spread batter evenly into prepared loaf pan and smooth the top. Gently sprinkle the remaining two tablespoons of raw pepitas on top. Bake for 55 minutes in the preheated oven. A skewer or toothpick inserted into the center of the loaf should come out clean. If the loaf is still under baked and the pepitas on top begin to burn, loosely cover the pan with aluminum foil. Coconut flour is very crumbly when warm. Let it sit the pan for 15 minutes before transferring it to a wire rack, to cool it completely. Slice only when completely cooled. A moist and delicious Pumpkin Bread to warm you on a chilly morning. Made with Coconut Flour, it is gluten free, low carb and bursting with fall flavors. 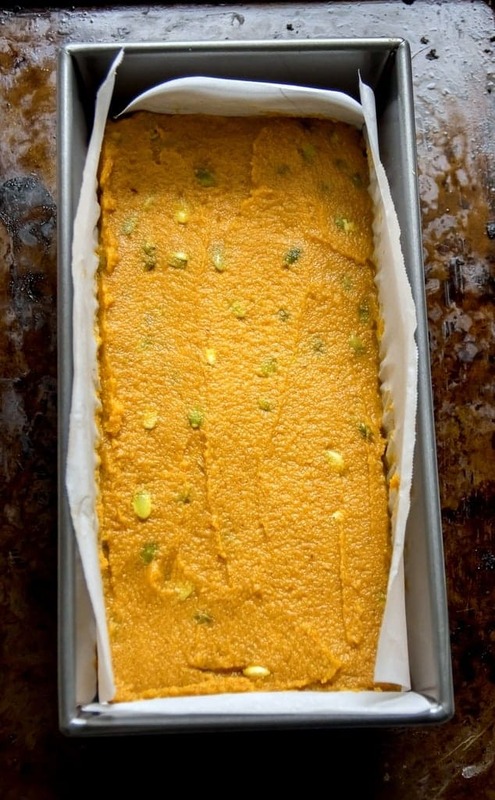 Line an 9"×4" loaf pan with parchment paper. Leave it a little hanging on the sides. It’ll be easier to get it off the pan. In a mixing bowl, sift together the coconut flour, pumpkin spice, baking soda and baking powder. Keep aside. In a separate bowl, combine the pumpkin puree, vanilla extract, maple syrup, and coconut oil. Whisk it well with a wire into a smooth mixture. Coconut flour can go stale very quickly. Always store the sliced in an airtight container, in the refrigerator. Since coconut flour is gluten free, we need eggs to give it structure. Unfortunately, this particular recipe doesn’t work well with vegan/flaxseed eggs. Chopped walnuts or pecans can be substituted for pepitas. Melted butter or vegetable oil can replace the coconut oil. Don’t have or can’t find Pumpkin Pie Spice? Add 3 teaspoon of ground Cinnamon, ¼ tsp of ground Nutmeg, ¼ tsp of ground Clove and ½ tsp of ground Ginger. How amazing is this recipe? It’s perfect for an everyday snack or for serving at your holiday parties! What is the Best Way To Keep Your Greens Longer? Progna Ghosh Sengupta is a A former software engineer, she had always loved writing and creating new recipes. When diagnosed with Type 1 diabetes and subsequently gluten intolerance, she focused her energy to develop healthy yet delicious recipes to help herself and other people with restrictive diet. This looks incredible! Seriously makes me want to grab it through my screen! I wish I was somewhat decent in the kitchen to be able to attempt this! Yum! This looks so good. I love pepitas too, they give a great crunch. This looks like a great recipe, and it’s perfect for the season as well. I can imagine myself eating this while drinking a cup of my favorite tea in the afternoon! I love that you topped it with pumpkin seeds as well. I love using coconut flour and I hope to utilize more over the next few weeks. Can’t wait to try this recipe. I have all of these ingredients in my pantry to make this! Thank you for sharing. I really need to work on cutting back on sugar and this is the perfect recipe to satisfy my sweet tooth! That looks absolutely incredible. 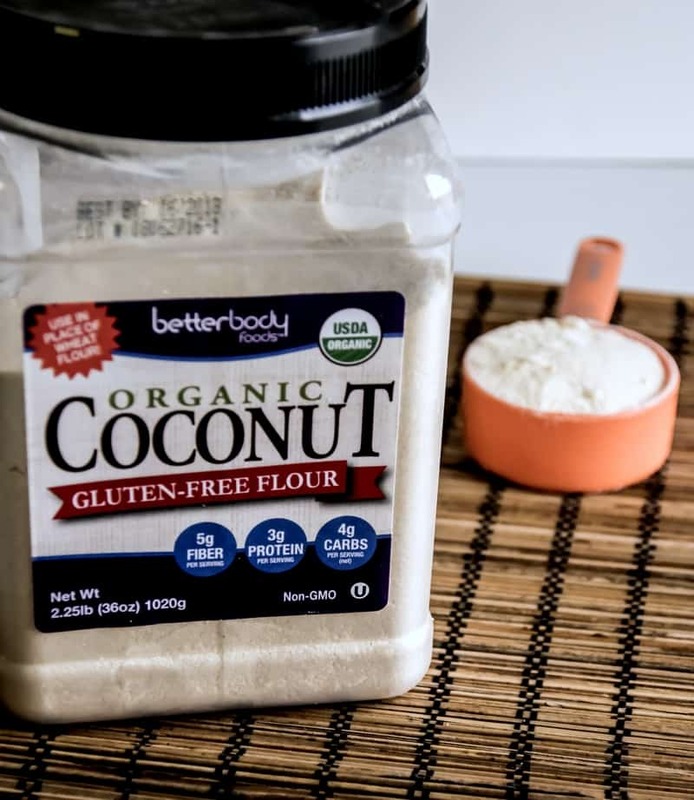 I have never used coconut flour before — but I have recently gotten into baking and eating healthier so it looks like I will need to check that brand out! I love anything pumpkin! This looks like such a tasty and healthy recipe. I love fall comfort foods and anything that deals with baking and pumpkins is totally my favorite. Thank you for sharing, can’t wait to try this one! I love the diversity of coconut flour. It’s so much healthier for you too. I need to make this for my family. This looks delicious! And perfectly time as I am always in need of gluten free recipes! I always wondered how they made coconut flour! Thanks for this recipe, it looks so scrumptious. I’m glad you have your coffee time back! This looks and sounds delicious in every sense of the word! I’ll definitely have to try out this recipe sometime soon. This looks so good! I’ve been trying to stop using regular flour for my family’s food. I’ve been looking into almond flour, but I hear coconut is way better! I’ll try it out for sure! Coconut flour is such a good idea, and I bet it would taste a lot better too. I’ve never used coconut flour before, I will have to give this a try. It looks delicious! This looks so good!! Can’t wait to try it. Reminds me of Starbucks pumpkin loaf with the pepitas on top! That looks delicious! My father is also diabetic and it is very hard to find yummy things that he can have. This looks like something I could make for him! This looks so perfect for the fall! And – can coconut be any more amazing and perfect? I started using coconut oil years ago for everything – now I am using other coconut products! Love! This looks delicious, being a diabetic with a sweet tooth must be tricky but it is great you experiment and find excellent recipes to stave off the cravings! Having to try this one I don’t think i’ve used coconut flour! I have never baked with coconut flour, I am curious the texture and flavor? Do you get a hint of coconut? I would love that! This looks amazing. So many of my favorite things. Pumpkin, fall snack, and healthy. Thanks! That looks so delicious! I didn’t even know they was such a thing as coconut flour. The Cutest Disney Backpacks for Girls!